The term “Impressionist Quilts” or “Watercolor Quilts” denotes a relatively new genre of quilting. These art quilts use pieces of fabric much like the impressionist painters used paint, allowing the bits of surface color to evoke much more upon gazing at a distance than one would see up close. To see examples please visit the gallery. This style of quilting has links way back in the english tradition, postage stamp quilts for example. 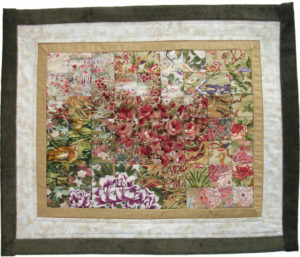 As a modern art quilt form, the first techniques were initially devised and popularised in the late 1980’s by the English artist Deidre Amsden. She called her technique “Colourwash”, evoking watercolor exercises that created washes of color shading across the surface. One could also call Marién Grace’s quilts “Cubist Quilts”, since her style evokes the intentions of the artists of that genre as well. One can get the impression of seeing the scene from more than one point of view simultaneously, be it in time or perspective. In Marién’s quilts’ scenery is generated by “blending” colors, textures and lines across seamlines with careful fabric selection. Often the lines that carry from one fabric to another are more important than the color changes. It is fascinating how the mind forgives details and creates cohesion upon gazing at the art quilts. Her technique of creating an impressionist quilt uses an extensive “palette” of 2-1/2 inch squares cut and assembled from her “library” of collected fabrics. These works all follow a simple matrix of construction: a grid. Within the exercise of these limited constraints intrigue and interest abounds from the selection of fabric and placement, creating landscapes that take the viewer on a journey into space and time. The quilts reflect themes of transition and edges in time and space in nature. The stitching or quilting of the layers is done invisibly in the seams, known as “stitch-in-the-ditch”, so that the viewer is not distracted by the surface of the quilt. This allows the viewer to be drawn into the landscape and to journey freely. Gazing at the quilts at a distance brings a spaciousness and cohesion to the landscape that, like in impressionist painting, becomes more abstract with detail when viewed up close. The longer one gazes, the more the landscape opens up to the viewer, its mysteries unveiled. The quilts are relatively small: wall-size (comparable to crib size), not bed-size. A sleeve is sewn on the back of each to permit hanging on a rod. Each quilt is labeled with its title, location made, year and season made, and of course the artist’s signature.